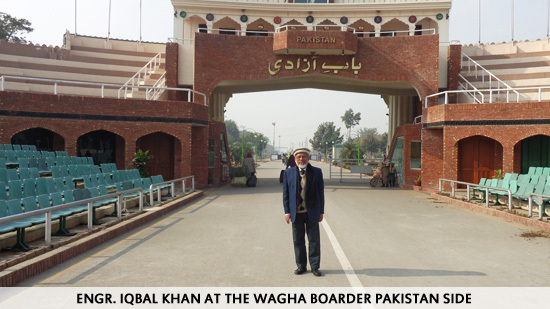 I completed my trip to Lahore and enter India via Wagah Border on foot on December 31, 2014. Visiting India this time was fun being a Senior Citizen I do not have to report to any Police Station of the cities I have the visa to visit. On single sponsorship I got visa to visit five places namely, Delhi, Meerut, Noida, Mumbai and Dharwad in Karnataka State. Wagah Border: Wagah is a village situated near a road border crossing on Pakistan known as Wagah Border whereas in India it is called Atari Border crossing named after the Indian village Atari. The border is located 24 KM from Lahore and 32 KM from Amritsar; it is also 3 KM from the bordering village Atari. As I was booked on a train from Amritsar Golden Temple Railway Station to Delhi so I could not watch the Wagah Border Flag Lowering Ceremony that happens at the border gate two hours before sunset each day. The flag ceremony is conducted by Pakistan Rangers (PR) and Indian Security Force (BSF). On the Indian side Ramjet Kumar was waiting for me to take me to Amritsar Railway Station, This gesture was from my cousin from Chandigarh who arranged all this. We visited the Amritsar city and finally Ranjeet Kumar and Harbhej Singh dropped me on the train I was booked. Visit to Delhi: When I reached Delhi Railway Station, this is the busiest railway station of India and handles 350 trains on a daily basis, it was 2340 Hours and it was about time when the New Year 2015 celebration to start in the city. As I was coming down from the platform the firework started and it was fun to watch the great show. Reached home and met all the relatives and the next day we went to Connaught Place the largest financial, commercial and business centre in New Delhi. As it was a holiday so it was very much crowded and looks like that whole of the city people are there. It is named after H.R.H. Field Marshal The 1st Duke of Connaught and Stratham. We enjoyed visiting many places around and have lot of fun. On our way back we have also viewed places from the car itself like the India Gate, Lotus Temple, Humayun’s Tomb and Akshardham Temple Parliament House and Rashtrapati Bhavan. The stay in Delhi was short so we cannot go in all the places and visit them. In the evening I met my nephew Aamir Anis and console him about the sad demise of his father Mr. Anis Ahmed, may ALMIGHTY rest his soul in eternal peace and give the family saber and grant him good place in Jannah, Ameen. Later I met first time my cousin Asif Ali who came to see me from a long distance. It was good to meet the family members after a long time. Visit to Meerut: Meerut is the city in the Indian State of Uttar Pradesh and is my birth place as well. 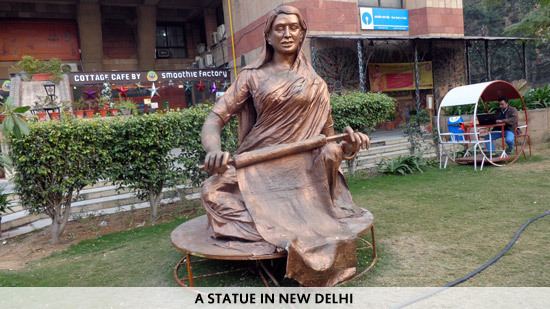 The city is very popular and is called the Sports Capital of India, It is also called as Scissor City. I have lots of sweet memories related to Meerut. Lot of my relatives are living in Meerut and also my old Saudi Aramco Buddy also lives here his name is Shahid Hussain. I met all the relatives and have many family parties arranged by my uncle Ch. Abdul Aleem Khan (Chote Mamoon Jan) and one at Nikhat and Saqib place. Both the parties were great and very well arranged and very delicious dishes were prepared at both the places. I did visit Shahid Hussain who is also retired and having a good time keeping himself busy with lots of reading and writing. Visited Kithore (my birth place) and went to the family graveyard and prayed for all the late family members who are buried there. Visited my uncle who is the eldest of the family and lives in Kithore as all his farms and mango orchids are located here. 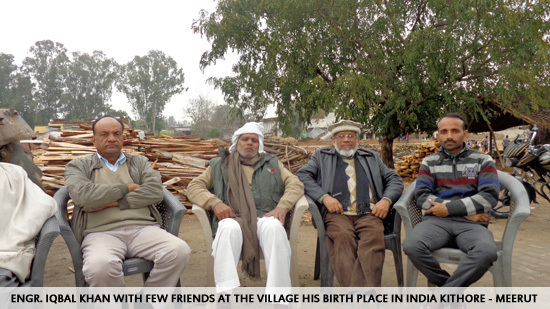 I stayed in Meerut for a week and met all my relatives and friends. My visa did not allow me to attend the wedding of my cousin Dr. Majid A. Khan which was scheduled on February 10, 2015. Visit to Mumbai: It was a happiest moment of ten (10) days visiting all my Ex-Saudi Aramco friends’ cousin who are involved in the Film Industry. 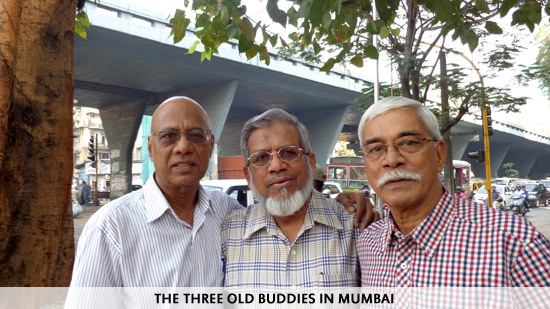 When I reached Mumbai Central Railway Station early morning of January 10, 2015 my friend Freddy P. Coutinho was there to greet me at the station. We took the taxi and reached Ashok Nagar in Andheri East where Freddy lives with his wife Irene Coutinho. Irene greeted me at the house and after the breakfast I decided to visit my cousin Tahir Khan in Andheri West –Millat Nagar and first stayed with him for three days and visit the places we planned earlier with him. Madh Island: Reached at Tahir residence and was greeted by Engr. Mohammad Zafar Shaikh nephew of Tahir and later in the evening met Engr. Mrs. Qamar J. Khan wife of Tahir. We planned to visit first the Madh Island. This is a very popular and is a group of several quaint fishing villages and farmlands in the northern Mumbai. We drove all along and noticed that there are several small shooting studios which are available on rent. We also visited “Bhatia Island Shooting Studio” and saw the shooting of the well known TV Serial named as “Crime Patrol”. We saw the boat joining Versova with Madh Island beach. Madh Island is a popular spot, which comes off surprisingly in the rural area of Mumbai’s north western coast. Madh Island Beach provides you a complete escape from the heat and dust of the city environment and it is a perfect destination to spend time. We enjoyed the trip. 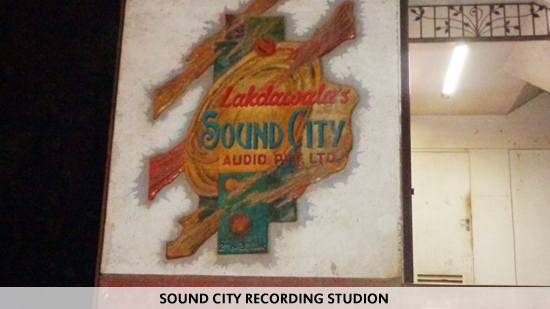 In the evening we visited a Sound City Recording Studio in Mumbai where Music Director Sajjad Khan was recording a folk song. It was also a very good experience of viewing the recoding techniques. 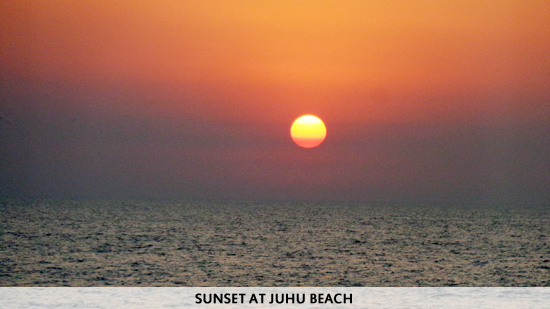 Juhu Beach: Juhu beach is located 18 kilometers north of the city centre on the shore of the Arabian Sea. The beach is the popular tourist attraction throughout the year and is also a sought after destination for shooting films. The beach generally gets more crowded on weekends with families and courting couples. The food court at its main entrance is famous for its “Mumbai Style” street food, notably bhelpuri, panipuri and shevpuri. We enjoyed the bhelpuri and fadula at the beach. The busy yet peaceful surroundings of Juhu is many Bollywood celebrities and also home to a significant portion of Mumbai’s Business elite. Hence Juhu has come to be referred to as “The Beverly Hills of Bollywood.” As we went on a weekend there was huge crowd of all communities. Bandra: Bandra is a suburb located in West Mumbai; it has the sobriquet “Queen of the Suburbs”. The suburbs have a long seafront. Several Bollywood actors live along the Bandstand Promenade, Carter Road and in the Pali Hill areas. Bandra is home to numerous churches, including Mount Mary’s Basilica. The Parsi Fire-Temple. Tata Agiary is located on Hill Road. Other famous religious places include the Jama Masjid (mosque) located near Bandra West Railway Station and the temple of Goddess Mari, located on SV Road. The population and culture of Bandra is quite cosmopolitan in nature. It consisted of mostly Christian but Bandra is now home also to sizeable Hindu, Parsi and Muslim populations. A new Taj Hotel is built at Bandra and next to it a Bandra–Worli Sea Link is constructed which reduces the travel time between Bandra and Worli during peak hours from 60-90 minutes to 20-30 minutes. We reached late and could not visit the Worli Sea Link. 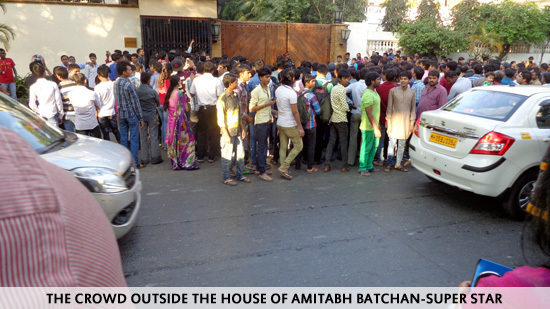 While we were going to Bandra we noticed that hundreds of people standing on the road on enquiring it was mentioned that there are the two houses for Amitabh Bachchan and Shahrukh Khan the Super Stars of Bollywood and people are waiting as they just come out to wave their fans at 1800 Hours. It looks that people are crazy about the Bollywood stars. 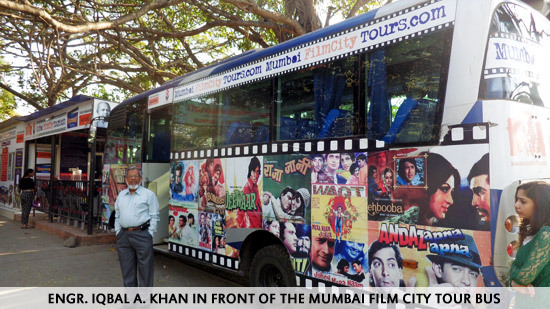 Mumbai Film City: My cousin Shakir Khan is a film director and we planned to visit the Film City. Shakir Khan, Tahir Khan his elder brother and me visited the film city. It was rare accomplishment in my hat the visit to Mumbai Film City. The film city is an integrated film studio complex which is situated near Sanjay Gandhi National Park at Goregaon East Mumbai. We saw many recording studios and Shakir took us to one where the shooting of TV Serial “Mahakumbh” was in progress. It is now I realized what you see on screen is far from how it is made. We got a chance to meet the well known TV Star Surekha Sikri who appears as Dadi sa of Balika Vadu and also met the TV Serial Director Arvind Babbal and the hero of the serial Ghutam Rode. The Film City is renamed as Dadasaheb Phalika Nagar in the memory of the Marathi producer-director screenwriter Dadasaheb Phalke who was father of film industry. 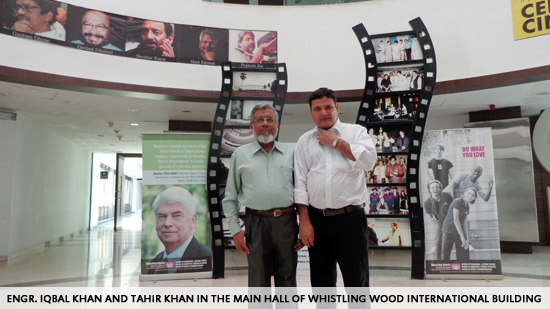 We also visited the Whistling Woods International which is a film communication and media arts institute and was founded by the Film Maker Subhash Ghai. Till date more than 1000 media and entertainment professionals have graduated from the school. Visit to Shakir Khan Residence: Shakir Khan hosted a dinner party at his apartment on the last day of my stay with Tahir Khan. Mrs., Zarien Khan prepared delicious fish, as she belongs to Calcutta, along with many other dishes. We all enjoyed the dinner and return late night from his place. I came back to Freddy’s place and we met our old buddies of Saudi Aramco. The gentlemen I met were Rochwyn Fernandes and Felix Saldanha and we went to meet Ibrahim A. Choughle unfortunately could not see him as he was out of town. Happy to meet Fred’s senior citizen friends, Joe Antao, Norman Fernandes, Michael Saldanha, Ronny Baretto, Naidu, Winnie Pereira, Denzil D’Costa and Miss Sandra Fernandes. The Senior Citizen Group meets daily in the evening and have lot of jokes to share. This keeps them happy to start a new day. Elephanta Island: Has the opportunity to visit Elephanta Island/caves-UNESCO World Heritage Monument. 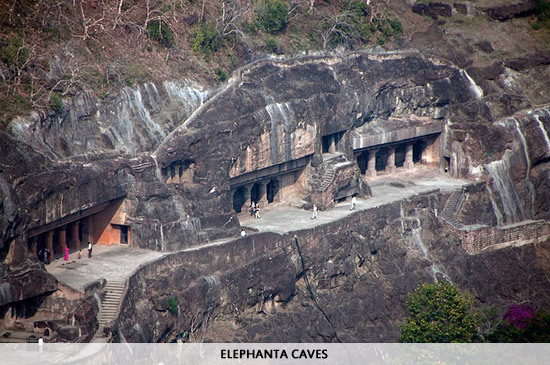 This island is a popular tourist destination because of the island's Elephanta Caves, that have been carved out of rock. The island is easily accessible by ferry from Mumbai, Taj Hotel/Gateway of India being about 10 kilometers from the island city. Ferry leave daily from the Gateway of India taking about an hour each way. The tickets for these can be bought at the Gateway itself. The first ferry leaves at 9 am, the last at 2 pm. From the boat landing stage on the island, a walkway leads to steps that go up to the famous caves. There is also a narrow-gauge toy train from the boat area on the dock to the base of the steps leading up to the caves Along the path, hawkers sell souvenirs like necklaces, anklets, showpieces and key chains. There are also stalls to buy food and drinks. Small monkeys play along the sides of the path, occasionally thieving items from the hawkers, trashcans and tourists. I purchased a corn and was enjoying it when I was trapped by the monkeys, one scared me and the other took away my corn. I was literally scared and was hardly able to save my camera. We enjoyed the great network of sculpted caves located on Elephanta Island. There are two groups of caves-the first is the larger group of five Hindu caves, the second a smaller group of two Buddhist caves. The Hindu caves contain rock cut stone sculptures, representing the Shaiva Hindu sect, dedicated to the god Shiva .It is 37 meters square in plan with a hall. At the entrance are four doors with three open porticoes and an aisle at the back. Pillars, six in each row divide the hall into a series of smaller chambers. We enjoyed our trip and learn a lot about the Hindu Mythology. Visit to Mumbai City: Mumbai is a fascination city. Travelling was fun in the State run buses BEST (Bombay Electrical Supply & Transport). Enjoyed the local trains both harbor and main lines. Though compartments were overcrowded, sense of safety was unbelievable. A three wheelers transport was amazing as the driver operated religiously taking fare as per meter. A section of Metro Train just started was very enjoyable with very reasonable and affordable fare. The stay at Mumbai was mostly with Freddy and his host wife Irene. Her pleasant and delicious vegetarian & Non-Vegetarian dishes were daily best tummy filling. Although she is a pure vegetarian but cooks non vegetarian dishes equally good. My ten days trip to Mumbai ended with a dinner party hosted by the Rajput family (Freddy’s daughter and son-in-law) at the famous Willingdon Catholic Gymkhana of Mumbai. The family consists of Mrs. Sejal Rajput, Miss Neharika Rajput, Master Veer Rajput and of course Mr. Sunjay R. Rajput. Both are bankers Sejal a Manager with RBL Bank and Sunjay, a Vice President with Royal Bank Scotland. It is worth mention of Miss Sandra Fernandes an IT professional, an energetic and good conversationalist who presented a small Mumbai delicacy of Cashew burfie as a token of remembrance. Visit to Dharwad: My next station was to visit Dharwad in the Karnataka State as we were about to book the ticket we were informed by our host and ex-Saudi Aramco friend RA Nidgundi that he had to leave for Bangalore along with his wife who is sick and need to be seen by a specialist doctor. So our plan to visit Dharwad was cancelled. We were very much disappointed by not seeing the southern part of India. Visit to Noida: My wife Mrs. Zohra Iqbal did not come with me as Javed Halim her brother who was sick went to USA for a month and as it was very cold she refused to go as her bother was not there. By the time I went to Mumbai Javed was back from USA and as my brother’s family was coming to India to attend a family wedding in Aligarh so Zohra accompanied them and came to visit her brother in Noida. In Noida the three bothers of Zohra are staying in ATS Towers 27 storey each and the kid brother Nadeem Khan is in Tower No-7, while Javed Halim is in Tower-8 and Suhail Halim the one works for BBC Urdu Service in Delhi lives in Tower-10. We had a family reunion in Noida as the other brother Pervez Halim came along with his family the sister along with her family came from Soehara and my niece came along with her family from Meerut and the other niece came all the way from Chandigarh along with her daughter Maisha. We all celebrated the 3rd birthday of Uzair the grandson of Javed Halim. Uzair was not with us as the parents recently shifted to Abu Dhabi. It was a great party and we all enjoyed the food and meeting each other after a long time. My sister-in-law Mrs. Namrata Tandon is working as an instructor with Intuition Herbals of India established by Swami Muktanand Maharaj-Naabhi Chakra Guru. Namrata arranged a meeting with the Swami Ji and we had a chance to meet him at his office. It was an inspiring meeting and we did talk on different subjects and learn a lot about the herbals and we also have good knowledge about the Chakras from Namrata as she is the expert at the Intuition Herbals. 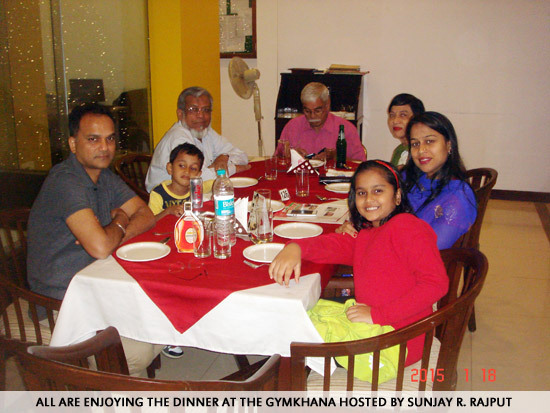 The stay at Noida is very memorable and meeting all close relatives is really great. 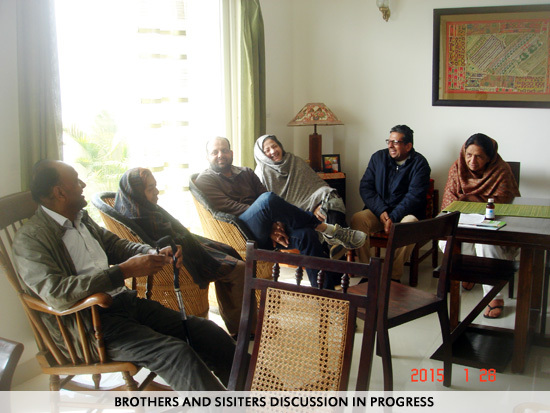 We enjoyed good dishes prepared by Shameem Javed at her apartment. Further it was real fun to enjoy the cold weather of the north part of India, Now its time to leave as I have to cross the border on January 29, 2015. 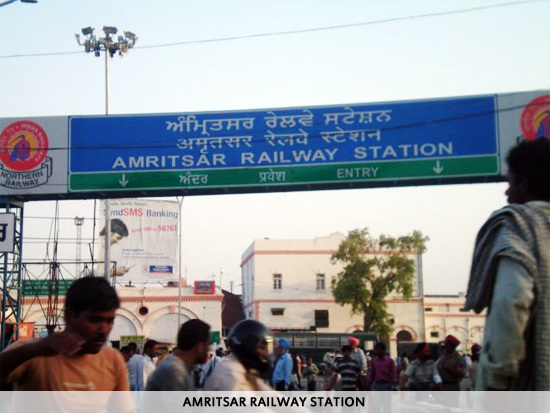 Visit to Amritsar We were booked by train for Amritsar on January 28, 2015 to reach mid night at Amritsar and stay with Noashad Farooqi our cousin who will be meeting us at the railway station and will dropped us at Atari Border the next day. Suhail and Nadeem came to drop us at the Delhi Railway Station and the train left at time and we reached Amritsar at 2230 hours. Noashad was little late as he thought that the train will be reaching at 2300 hours. He came all the way from Chandigarh to see us off to the Atari Border. He arranged a place to stay for the remaining part of the night. Visit to Golden Temple: The next morning we took our breakfast and after that I requested Noashad that I want to visit the Golden Temple the holy place for the Sikh Community. It will not be fair if being in Amritsar and not to visit the Golden Temple. So we both went to the Temple and the place was under very high security no cars were allowed so you have to walk to the temple. We reached there and it was quite an inspiring place. You have to cover your head by a special orange color scarf which was available there on the shops. As we were having a cap on our head so it was not necessary to buy the scarf. The area is huge and the sight of the Golden Temple is inspiring and you can see the pilgrims were there from all over the globe. Amritsar is one of Punjab’s principal cities dating back in history over 400 years. 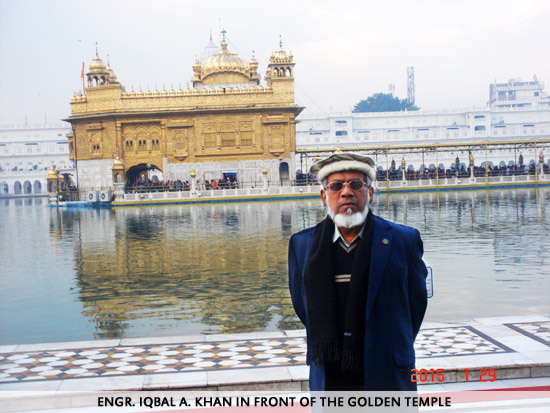 It is known more for the famous Golden Temple, the seat of Sikh religion The city is also gateway for the travelers on the overland route through Pakistan. The Wagah Border which is the check post is 28 kilometer away. Amritsar literally means “the pool of nectar” the name derived from the pool constructed at the sacred site in the 16th Century, gifted by the Mughal Emperor-Akbar to Guru Ramdas, the fourth preceptor of the Sikh faith. 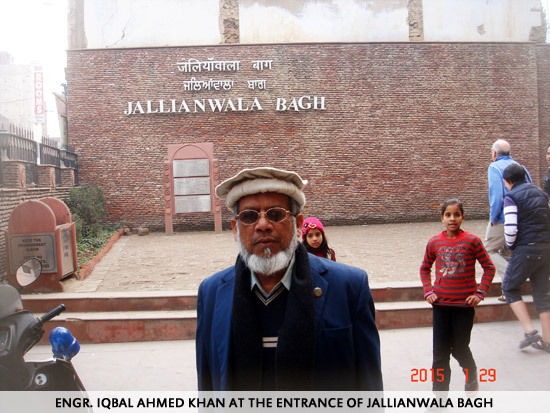 Visit to Jallianwala Bagh: The next place we went to visit the historical Jallianwala Bagh the history of the same is as: The 1919 Amritsar massacre, known alternatively as the Jallianwala Bagh massacre after the Jallianwala Bagh (Garden) in the northern Indian city of Amritsar, was ordered by General R.E.H. Dyer. On Sunday April 13, 1919, which happened to be 'Baisakhi', one of Punjab's largest religious festivals, fifty British Indian Army soldiers, commanded by Brigadier-General Reginald Dyer, began shooting at an unarmed gathering of men, women, and children without warning. Dyer marched his fifty riflemen to a raised bank and ordered them to kneel and fire. Dyer ordered soldiers to reload their rifles several times and they were ordered to shoot to kill. Official British Raj sources estimated the fatalities at 379, and with 1,100 wounded. Civil Surgeon Dr Williams DeeMeddy indicated that there were 1,526 casualties. However, the casualty number quoted by the Indian National Congress was more than 1,500, with roughly 1,000 killed. Apart from the many deaths directly from the shooting, a number of people died in stampedes at the narrow gates or by jumping into the solitary well on the compound to escape the shooting. A plaque in the monument at the site, set up after independence, says that 120 bodies were pulled out of the well. After the visit to the two historical places in Amritsar we took the taxi and reached the Atari Border and it was time to say thanks and good bye to Noashad Farooqi who came all the way from Chandigarh to drop us to the border. After all the formalities we reached the other side of the Wagah Border. We took the taxi and reached the Allama Iqbal International Airport where we were booked for Karachi via Shaheen Air. Alhumduellah reached home safely after a forty days long trip. Indian Train Network: The train network in India is great. All the booking is online and the service is fantastic. I travelled about 5000 Kilometer using Indian trains. I enjoyed it and the service for short distance up to 500 Kilometer they serve you with snacks and later dinner or lunch. If you are travelling more than 500 kilometer the service is further good you get snacks, dinner, bedding and morning news paper and morning tea and then the breakfast. Last but not the least I want to thank all my friends and relatives who took their precious time and made my trip a success.